Welcome to Tsurunoyu Onsen. This wooden Minshuku is located near Yamanoyado Bekkan, and it has 30 Japanese-style guest rooms. None of the guest rooms have their own private bath and only a few of the guest rooms have their own private toilet. The hot spring baths here date back over 350 years, and there are indoor and outdoor hot spring baths for both women and men (same gender only). There is a "family bath" which can be privately reserved, and there are also mixed outdoor hot spring baths for both genders. Traditional Japanese cuisine is served to the guests at Tsurunoyu Onsen. Parking is available. I have been to many ryokans in Japan. This is one of most my favorite. The way to this ryokans quite not easy. We take high speed train from tokyo and 2 bus till arrived ryokan. but first time that i saw this ryokans.. It make me relax with nature. the day that i visit, the snows has fall during day and this place like a dream. the ryokan is clean, a staff are very helpful, and onsen(milky water ) is a best of onsen that i ever visit. i have very recommend to visit this ryokan. The realm of imagination that really touched. Is my wonderful birthday gift. I went to many hot springs. Which is different But here is the place that I dreamed of getting onsen in the midst of falling snow. Including natural accommodation The food at the service was excellent. Very tasty. The staff provided excellent and friendly service. It is my best impression of this stay. This was our second visit to Tsurunoyu. So good the first time, just had to return! Even better this time as we were able to book a larger room with in-room iori, which made for fantastic dinners. Also love the fact you could slide open the glass door windows and put your beer out in the snow to keep cold (very warm and snug in the room), noticed little bottle shape dents in the snow from previous guests :) The staff as usual very helpful and friendly. Was also impressed to discover one of the young gentlemen, belonging to the ryokan, is a world class white water kayak competitor. The mixed onsen is incredible, especially when it is snowing and surrounded by deep snow. This onsen ryokan ticks all the boxes, remote and natural, great food, wonderful people, beautiful milky coloured onsen, just everything! Thanks again to Vincent of Japanese Guest Houses, without whom booking here is just about impossible for most western visitors. Great advice given on how to get here and arrival advice etc.. from him too. We totally loved our two-night stay in this magical and rustic ryokan. Despite the required early booking (6 months in advance) and long travel to reach there (Shinkansen + local bus), we enjoyed every moment we spent on the tatami room, which offered a fantastic snow-capped view of the mountains and the onsen area, and the surreal experience of soaking in onsens surrounded by snow and while sometimes drenching in snowfall. Even though the ryokan allows day-tripping onsen-goers, we highly recommend anyone to spend overnight there to fully immerse in the before-dawn and after-dark onsen experience. Most importantly to avoid the heavy tourist crowd/traffic during the day. Also a big shoutout to the friendly and professional service provided by japaneseguesthouses.com. Without their help, we would have surly missed out our chance of staying in this surreal place. Thank you very much. Great room, with toilet. Dinner (copious and tasty) is served in the traditional irori room. The staff are very nice. 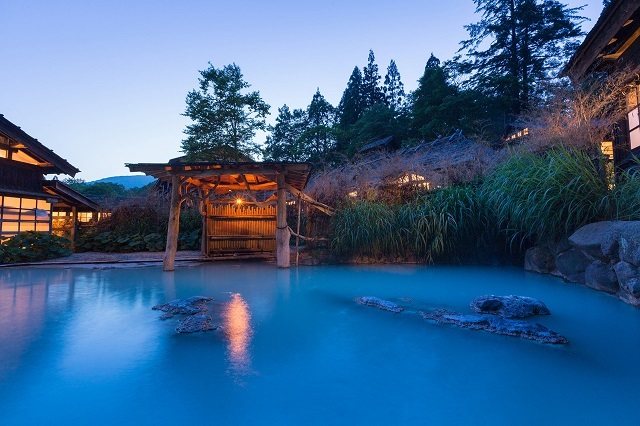 The best of all is the superb outdoor onsen. It was worth taking two buses from Tazawako station to arrive there. It takes 2 buses to get here from Tazawako station, so just a heads up to those that are bringing heavy baggage. Stayed for 2 nights here with my wife in early December. We stayed in the 1 gokan room which was on the second floor of the building(same building as the reception). We loved our room as it was just the right amount of space for 2 people. We also has a nice balcony view. Dinner was served in our room and breakfast was downstairs in a big dining room/hall. There were 2 public toilets for each Male and Female on the same floor as out room. Very clean toilets with bidets. We thought the place would be covered in snow, but it seems that it was still early in the season this year. We were told January or Feb would be the best time for that. Luckily, we did see snow falling very hard on our 2nd day, we were happy and glad. The staff were very nice and they did have people that did know how to speak very basic english. It would help if you learned a little basic japanese words before coming here in my opinion. Futons were ‘Excellent’ and ‘Comfortable’, missing them already, we got a very good nights sleep. The onsen was such a great unique experience for us, and we will like to thank Japaneseguesthouses for easily booking a room for us. We would definitely come back if we get the chance again in the future. We had a wonderful time at tsurunoyu onsen! We spent one night at the ryokan in the middle of November. The air was chilly and the warm water was so relaxing. The rooms were really warm and comfortable and the staff was super friendly. The food was delicious with several local specialities. I would definitely recommend spending the night to be able to enjoy this peaceful place without crowds, we were even completely alone in the hot springs several times. As a woman I didn't think it was uncomfortable at all to be naked in the mixed gender hot spring, the entrance from the female dressing space is hidden so you enter the onsen behind some rocks, and once you get in the water is so milky that you can't see through the surface. It was easier than we thought to travel there, the train from Tokyo is direct shinkansen about 2 hours 40 minutes. It was easy to take the bus from Tazawako station, they will help you call the Ryokan to make sure there is a shuttlebus to meet you at the bus stop. Everything about this place is simply perfect! I stay 1 night in Tsurunoyu, room with toilet without a bath, booked 6 mths in advanced. First I must say a very big thank you to Japanese Guest House to making this possible!! I really appreciate it very much! Their response is very fast and Super reliable!! Thanks for making my experience possible at this beautiful ryokan. Tsuru No Yu is a rustic ryokan with basic meals. I tried the private bath which is small. I tried the female common bath which indoor bath is very small but the outdoor bath offers good view and is spacious. I also tried the mixed gender bath which is their signature selling point. View is beautiful here but is visible from the outside. The water is milky and my body feel super nice and smooth after bath. Be prepared to carry your own luggage as they are very busy with overwhelming guests. For me, I just used haversack to carry 1 change of clothes and left the rest of my big luggage in our rental car. Food is basic. Scenery is rustic and beautiful at Tsurunoyu. At the entrance, there is a map for those who would like to go for hikes around the area but beware of bears so hike at your own risk. We enjoy walking around Tsurunoyu surrounded by beautiful autumn leaves and the bath. Atmospheric, wooden building, damp in the cloud and rain this time. Rather basic facilities. But thoroughly enjoyed the experience. Baths were great - indoor small, wooden tub and very hot, large outdoor pool allowing plenty of space to enjoy the environment. Fun to sit in the warmth of a pool, enjoying the autumn colours despite mist and drizzle. Good dinner in the room, delicious. Breakfast in a Japaanese dining room, but individual service. Loved this secret onsen with amazing view, friendly staff and delicious food. I've try the mixed outdoor onsen and it is ok for ladies as they have different entrance. I've wish to stay in the honjin style room but is fully booked even I make reservation 6 month in advance. Wonderful ryokan, helpful and kindness staff, very beautiful in autumn season with difference color of the leaf behind the ryokan. The dinner is so basic compare with another ryokan we’ve been before. One of the most atmospheric onsen ryokan I have stayed at, great staff, service, food, and bathing! One thing perhaps worth noting is that the dinner is slightly more basic than the kaiseki fare one might have elsewhere, but it's still more than generous and sufficient considering the price. Also due to the extraordinary heatwave that stuck Japan this year, it seems the horsefly population went a bit out of control in the area which made daytime outdoor bathing a bit difficult. However this was just bad luck, and after talking with regular guests does not seem to have happened in past summers. I have spent a night in june at Tsuru No Yu onsen and It was trully an Amazing experience. I have seen pictures but in real it even more beautiful. Far from everything, the baths are amazing. I was alone, and I follow a plant-based diet, and they cooked a delicious meal just for me! Thank you very much Tsuru No Yu onsen for this amazing experience and thank you to japanese guest house for making this possible ! This is one of the best places in Japan, everything it's amazing about the place, location, atmosphere, food. Truly unique place. It’s worth to visit. The onsen were great. Rooms were tiny, clean and comfortable. Shared bathroom and toilet were cleaned. Staff were friendly and helpful. The food was delicious with local ingredients. The private onsen was great too. Beautiful atmosphere , highly recommend . Very nice place. In winter, this place is like a fairy tale. Warm cozy rooms, friendly staff and very tasty food. I am the first time in Japan and a similar place. The hot spring is gorgeous. You can visit a separate or shared pool, water is milky, so you can not see anything. I am so impression to go to there. This is the amazing part of Japanese culture. It is a amazing. I sleep at Tsurunoyu Onsen 1 night. This is the first time to me for onsen. I am so excited. Delicious dinner and breakfast. And I impression for good service of reception everyone. Next year I will go to Tsurunoyu Onsen in second time for sure. Thank you Japanese guest houses for good service to coordination reservation with Tsurunoyu onsen. Thank you for make my dream is true. It was a fantastic experience! It took a while to get there by public transport but really worth it. I visited this onsen with my lover so it was very romantic too. We loved the baths, the food, our room was comfortable and warm. The staff was very helpful and kind. It was just an amazing genuine Japanese experience! Thank you so much! First of all, thanks to the japanese guest houses to help booking, especially when I was alone, because the hotel usually does not accept one person. Although the hotel location is more remote, hotel and room settings is simple, but because of this, the hotel environment is very quiet, the scenery is very beautiful, allowing you to have time to carefully appreciate the scenery around the hotel, you can leave the city, the state of mind can reply Calm, have the feeling of coming home. At the same time, the staff\\\'s service attitude is very kind, breakfast and dinner can fully reflect the flavor. This ryokan was absolutely amazing. A true winter wonderland experience. 5-stars. Atmosphere: Upon entering the ryokan, it felt like leaving the modern world behind. Sure, there's wifi, but this ryokan lives and breathes at a different pace. Eating, sleeping, and bathing soon become a routine that induces relaxation. The various temperatures of the onsen allow adapting this routine to your preference; super hot private baths, warm to hot mixed bath, and everything in between. Food: Food is included for breakfast and dinner; lunch is not included but can be ordered a la carte. You can't order your breakfast or dinner, it is prepared on a rotating schedule so that you won't get the same dishes twice. The food itself is simple, local and tasty. I have never had so many mushroom dishes in my life, but each of them was excellent and tasty. Especially the salted grilled fish was marvelous. Staff: Staff is very friendly, both at the front desk and in the dining room. Not everyone speaks perfect English, so sometimes it requires a bit of patience to make sure you're understood. There are a few people at the front desk that speak perfect English though, so you'll be able to communicate if you catch them when they are working. Location: The location is remote and secluded. If you come by car, it's easy to find with GPS navigation. There is a bus that runs between the other onsen in the area and it's really easy to navigate. Highly recommend heading to other onsens to savor different types of waters and surroundings. Room: The room is comfortable, but can be a bit small if you choose one of the cheaper room options. Still, the room is well insulated and the beds are comfortable. Most buildings are old and picturesque but are well maintained and practical. The bathrooms are outside of the room, usually a short walk away. While a bit inconvenient and the walk to the bathrooms is a bit cold in winter (it's indoors and heated, but just not at the same temperature as your room), it isn't too bad, especially since the toilet seats are heated (gotta love Japan!). Nyuto Onsen est un endroit à faire ! Sous la neige c'est encore mieux ! Le ryokan possède deux onsen privatif (premier arrivé, premier servi), un rotenburo mixte et des bains hommes/femmes. Le repas est typique de la région et très japonaise (attention à ceux qui n'aiment pas les légumes haha). 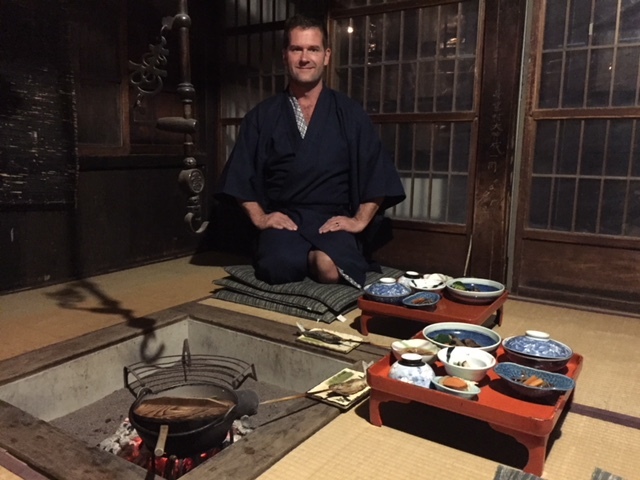 We were very lucky to be able to experience traditional ryokan in such rustic place. Basic simple, in a secluded environment with spectacular traditional architecture. Love the very basic indoor hot tub pre-soak before the outdoor spring (Just a bar of soap and a couple of wooden stools). We were blessed with a good weather at -4Degree. Even our 8 year old son loved the outdoor mixed onsen, as it was winter and the water was just nice for him. I actually enjoyed the indoor ones more as they were hotter. But the outdoor was just lovely with the views and snow. Food was lavishly veggies, which is awesome for my vegetarian husband (who didn't mind the fish/pork broth). Our room overlooked the mixed hotspring diagonally, and the scallops of snow capped roofs of the indoor baths just added to the theatrical wonder of a magical rustic charm. We only managed to stay 1 night, would love to stay 2 nights for a complete enjoyment and taking in of both the hot springs and scenery. Tsurunoyu Onsen was the most amazing place I have ever visited. Going in the winter when everything was all snowy was so cool! It made the hot springs even better and it created this amazing atmosphere. The staff were so friendly and helpful, and though they did not speak much english, they understood all our needs and showed us how everything worked! I would definitely recommend brushing up on proper onsen etiquette before your stay though to be as respectful as possible! The food, lodgings, and attire were of very high quality and made the stay even more enjoyable and authentic. The private family bath was really great. For women bathers, there are two women's baths that are separate, and be aware one is super hot, while the other is just normal hot lol. I didn't realize they were different temperatures the first time and went into the super hot one! I wish I had started with the more mild one first, so I would suggest that for visitors! The mixed bath was also nice, and the women's entrance into it is mostly covered, so if you are modest you can get in without being seen. We had a magical time there and will definitely go back someday! This is a awesome experience beyond my expectation. I had a great time there and had a good memory of experiencing the mixed outdoor milky onsen surrounded by snow and trees, the sound from canal nearby, the starry night, the classic ryokan with helpful staff and the tasty local food. If I have a chance I’ll be back again. If you want an authentic onsen experience this is the one to choose. It is not posh but a magical experience I don’t believe you will find elsewhere. Staff are charming and work hard to meet all your needs. All meals are delicious made from fresh local ingredients in authentic Japanese style. We enjoyed hiking during the day to soak at other onsen in the area, however, a delightful snowfall ruled out that activity on our second day. A huge shoutout to Vincent of Japanese Guesthouses for handling our reservation and subsequent date change. His patience and service was truly appreciated. Me and my friends stayed for only one night and we wish we could have stayed longer. The baths are great, the buildings are really traditional surrounded by the forest. The food is delightful. I am grateful and extremely happy that we stayed at Tsurunoyu. Getting there takes longer than you expect--the bus takes forever!--but is not at all difficult, even for non-Japanese speakers (and if you are traveling by train, the tourist information attendants at Tazawako station are very nice and helpful). That long trip results in a feeling of true isolation: at night, we were the only non-Japanese people probably for 10 miles around (during the day, there were occasional Chinese or Korean tourists; I believe we were the only Westerners, though). There will be nothing other than clouds preventing you from seeing all the stars in the night sky. Rooms are rustic, meaning they are old and rickety (scratched furniture, cracking wood, etc.) but quiet, comfortable, and full of character. The food is also rustic; it's simple but delicious, featuring a miso soup with dumplings and two kinds of mushrooms that's one of the heartiest things I've ever eaten, and probably a dozen different types of fermented fish (over our two day stay), including some that are so fermented you simply eat them whole. Portions are enormous, especially at dinner; we usually couldn't finish more than half of our food, even though essentially every dish (and there are more than 10 at dinner alone) is great. (It does get a little sameish after the third or fourth meal, though.) The baths are amazing, the outdoor rotemburo is just what you're looking for (but closed on Mondays for cleaning, take note!). In many ways Tsurunoyu's baths are the platonic ideal of an old-school onsen; the water's very, very hot at some of them, and they're so simple (just shelves for your clothes, buckets, natural fountains, and the hot spring, no personal shower faucets or soaps except in the reservable private "family" baths). It's easy when bathing to imagine people hundreds of years ago doing exactly what you are doing. Staff is outstandingly friendly and helpful, even with the language barrier issue. No complaints about anything. There is really nothing to do around the onsen without a car, especially during winter, so bring a book or stay only one night (but arrive as early as possible and stay as late as you can, including a bath before and after breakfast!). It's one of my favorite things we did in all of our two weeks in Japan. I doubt we'll ever be back (maybe in another few trips, to make an excuse to visit Tohoku again), but if we're ever within a hundred miles we'll definitely stay another night. It was great! The scenery was beautiful, the people nice, and the food great. The onsen were also really nice - lots of choices for indoor and out. Even though the Ryokan was busy, the onsen was never full... probably because there were so many options. It was really nice. I would love to stay here again. Great trip! The pure white snow scenery was fabulous! The staff are very nice and the dining is very natural. I do love the atmosphere of the place, like a fairy tale wonderland. Onsen are good for your health. (I had a leg operation and have to use a crutch. Trust me, it's soooooo nice to lay down in the hot pool and enjoy the sound of snow fallin' on your head.) I can't wait to visit Tsuru-no-yu again next year. A gem in Akita, Japan! My boyfriend and I stayed at Tsurunoyu for one night in March of 2014. It was truly a once in a lifetime experience for us. It's well worth the shinkansen and bus you need to take to travel here. The staff were helpful, the setting is rustic, the scenery was breathtaking and...the FOOD. The food was delicious - too much, in fact...we were quite full by the end. Even though Akita winters can be quite cold (keep in mind most Japanese houses don't have central heating. Room are individually heated with kerosene heaters)..it's the best time to visit onsen country in Tazawako! Note: Even though the 'mixed bath' with men and women might seem scary to some...it's totally worth it. And ladies, there's a large tunnel-like rock wall right at the women's entrance...so nobody can see you slip into the water! More people need to discover the beauty of Akita! It was an unforgettable experience and I'd recommend it to anyone. I had a great time there. It was my first time in Japan and this trip made my day. The ryokan staff is helpful. The room is also clean. There are 2 indoor onsens for men and 1 outdoor for mixed gender. I was first a bit nervous but then nothing to be worried. Dinner is served with its local food which is yummy. This was the first place we stayed in Japan. Turned out to be one of the best too. The areas is wonderful and was partially covered in snow in mid-April when we visited. The hot baths were nevertheless VERY hot! The staff were helpful (not much English spoken, but we managed without knowing any Japanese). Meals: we are vegetarian and were provided a wonderful vegetarian (maybe vegan) meal made in tradition style. Getting there: We took the bus from Tazawako railway station. The public bus took us to Arupa Komakusa, and from there a shuttle bus that takes us to the Onsen. The tourist information-centre staff at the Tazawako railway station were very helpful (and spoke English), and telephoned the ryokan for us, to arrange the shuttle bus from. This was our first visit to Japan, and our first onsen experience. We only stayed one night (booked out) and it was absolutely amazing. Dinner was what you would get at most Ryokans, and we found a few things that werenâ€™t that nice to us (not due to the quality, just our western palate), but we tried everything and there is so much food that you will not go away hungry. As we were travelling as a couple we only tried the big mixed outdoor onsen. It is something that I will never forget, just the most beautiful scene you could imagine. I would highly recommend booking early as it is very popular with local tourists and we were lucky to even get one night. Authentic Japanese onsen in delightful setting. We were lucky to book here for 2 nights - thank you Japanese Guest Houses for your assistance and excellent instructions to get there. The staff at Tazawako Railway Station Info rang ahead for us on arrival. The office at the onsen was not obvious - as it is at the far end of the building - there is no english signage at all - so felt we really were in a genuine setting.We were in a small basic room but the surroundings were as beautiful as the buildings and the mixed outdoor hot spring was as lovely as I had hoped. We were surprized at how much snow was still left in drifts on the ground.We walked up the track past the small tori and up the lane for a lovely half hour walk. Later we walked downstream on a very muddy/snowy track to a beautiful small suspension bridge by a waterfall. (30/45 mins) The food was warm and nourishing.We wish we had realised there is a small cafe to one side of the entry - by the amazing telephone booth - but only saw it as we were waiting for the shuttle bus out. Highly recommend. Loved the milky mixed outdoor bath. I have been to many ryokans in Japan. This is my most favorite. The atmosphere is very good for those who want to stay with nature. The room is not modern or equipped with those facilities as in others modern ryokans but it is clean, natural and give me a feeling of being at home. I feel very relax and comfortable to stay here. The staffs are very nice and helpful. The food tastes really good. Dinner is served in our room and it is very surprise that they use the real old Japanese stove which was built at the building floor to grill the fish and warm the soup. The outdoor onsen is superb, imagine you are bathing in a milky water while it is slightly snowing. I will go back again for sure with a stay of at least 2 nights.